POLICE DISCOUNT G SHOCK WATCHES! G-Shock is a brand of watches produced by Casio, which is known for its resistance to hard knocks and toughness. Its full form is Gravitational Shock. They are designed for sports, military and outdoor adventure activity; nearly all G-Shocks have some kind of stopwatch feature, countdown timer, light and water resistance. The first G-Shock was born back in 1983, thanks to Casio engineer Kikuo Ibe. Heartbroken by a broken pocket watch that was given to him by his father, Ibe decided he wanted to create an ‘unbreakable’ watch based upon a triple 10 philosophy. Which meant it should be water resistant to 10bar, have a minimum 10-year batter life and be able to survive a 10-metre drop! The desire to achieve this consumed the young engineer and he subjected prototype after prototype to rigorous testing, revising each design and eventually arriving at the famous design that is still produced today, the G-Shock DW-5600. It is Ibe’s never give up attitude that began and has remained at the core of G-Shock, and it is the driving philosophy of the brand. They continue to push forward with leading innovation and progressive thinking that allows them to continue technological advancements in their pieces. Today G-Shock timepieces come equipped with solar power, GPS, Bluetooth technologies and mush more! 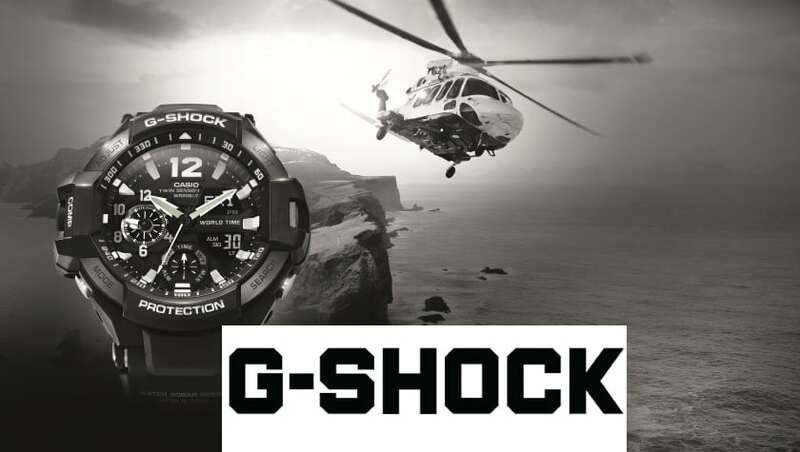 G-Shock has a wide variety of collections that spawned from the DW-5600, focusing on different land, air and sea requirements. So if you’re in the market for a progressive watch that remains one of the toughest watches of all time, you need look no further than G-Shock. Whether a gift for a loved one or for yourself, we provide the most recent and best G-Shock promotions and offers to help you get an amazing watch for less. Here at Police Discount Offers we have teamed up with the good people at G Shock to bring you this Amazing offer for the Police Community and their Families! Just choose the watch you want and add the discount code at the basket stage. If you don’t fancy anything on the G SHOCK website, why not try the Outlet store where you could pick up an awesome bargain on G Shock watches which have up to 50% Discount when you buy online. Police Discount Offers have also found this great deal on Amazon where you get up to 50% off lots of G-SHOCK watches on Amazon. All styles and colours available, prices start from £40.00. Get involved before all the stock disappears!